Tag line: "Family values. Power to the people. Stick it to the man"
For many fans, Viggo Mortensen will always be Aragorn, the kingly warrior of Peter Jackson’s Lord of the Rings trilogy. But there’s more to him than that. A quick glance at his filmography tells us that Mortensen’s screen debut came courtesy of Peter Wier’s exceptional 1985 film Witness (he played an Amish guy named Moses), however my first experience with the actor was 1990’s Leatherface, the third entry in the Texas Chainsaw Massacre franchise, in which he portrayed a member of the murderous Sawyer family. 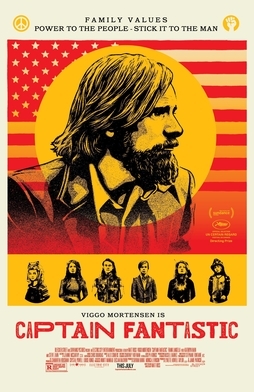 Since then, Viggo Mortensen has had supporting roles in some big movies (Carlito’s Way, Crimson Tide) as well as a few smaller ones (The Indian Runner, Sean Penn’s directorial debut, was based on the Bruce Springsteen song "Highway Patrolman", and is a decent little flick); starred in a pair of excellent David Cronenberg thrillers (A History of Violence, Eastern Promises); made some underrated westerns (Hidalgo, Appaloosa); and depressed the hell out of us in John Hillcoat’s extraordinary post-apocalyptic drama The Road. That’s quite a resume, and Mortensen is a big reason why the pictures listed above are worth checking out. But for my money, it’s his Oscar-nominated role in writer / director Matt Ross’s Captain Fantastic that shows the actor at his absolute best. For years now, Ben Cash (Mortensen) and his family have been living deep in the wilderness, turning their backs on society and technology while, at the same time, learning everything there is to know about government, philosophy, literature, and even physical fitness. Thus far, Ben’s “experiment” has been a success; each and every one of his six kids: Bo (George MacKay), Kielyr (Samantha Isler), Vespyr (Annalise Basso), Rellian (Nicholas Hamilton), Zaja (Shree Crooks), and Nai (Charlie Shotwell), can hold their own in a political debate, and know more about math and science than a college graduate with a Master’s Degree. In addition to their schooling, the Cash children spend hours a day in physical training (jogging, push-ups, etc), and have been taught how to hunt using nothing more than a knife. Their lives are thrown into chaos, however, when Ben learns that his beloved wife Leslie (Trin Miller), mother to all of his kids, has died. His partner in this grand experiment, Leslie spent the last several months in a hospital being treated for bipolar disorder, and committed suicide a few nights earlier. Leslie’s father Jack (Frank Langella), who never approved of either Ben or his daughter’s free-spirited way of life, has taken control of the funeral arrangements, and plans to bury Leslie in the family plot, ignoring her final Will and Testament (she wanted to be cremated). To stop the funeral, Ben and his six offspring hit the open road, and it’s during their travels that the kids get their first taste of the outside world, which, to their surprise, isn’t nearly as bad as they thought it would be. With equal doses of comedy (the family’s various interactions with the “real world” are, at times, hilarious) and tragedy (the scene where Ben breaks the news of Leslie’s death to his children is positively heartbreaking), Captain Fantastic weaves a life-affirming tale about a unique family that, having spent so much time in isolation, is thrust into a society that none of them are prepared to face. Mortensen delivers a subdued, yet ultimately satisfying performance as Ben, the loving dad who in wanting the best for his children didn’t adequately prepare them for the outside world (an early sequence in which Ben shows Bo and the others how to stalk a deer through the woods is contrasted by a later visit to a roadside diner, which has hot dogs and milkshakes on the menu). The movie does take the occasional jab at society’s weaknesses (including the modern education system), yet doesn’t canonize Ben Cash or his philosophy in the process; despite his advanced intelligence, Bo has no idea how to talk to Claire (Erin Moriarty), the pretty girl he meets at a camping site. And it’s this honest approach to its lead character’s way of thinking that makes Captain Fantastic such a thought-provoking motion picture. Thanks to Mortensen’s outstanding performance and the fine supporting cast surrounding him (the young actors playing the Cash children are especially good), not to mention Matt Ross’s clever, insightful script, Captain Fantastic proved to be one of 2016’s most pleasant surprises.